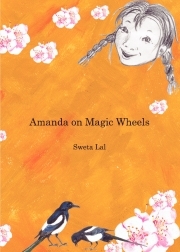 Description of "Amanda On Magic Wheels (eBook)"
Its a story about a girl Amanda who fights against all odds in her life to emerge a winner. She has been crippled by disabilities, an unfortunate event in her life. The story tries to capture the emotions of the little girl Amanda who knows what her dreams are & how to achieve them. In this journey she finds good friends & treasures lovely memories too... memories of making her parents proud. Amanda's life is motivational & will surely impart good morale to budding children. This story has been written to create awareness about the disabilities children suffer & its repercussions. The book is also an attempt to combine entertainment with education as there are notes to the text which children would find easy to follow & enrich their vocabulary. Reviews of "Amanda On Magic Wheels (eBook)"
Wow! What and amazing and wonderful book. Its a highly inspiring book.I will highly recommend it. Very well versed and appropriately narrated. The author seems to be an experienced one seeing the quality of sentences and words used in the book.